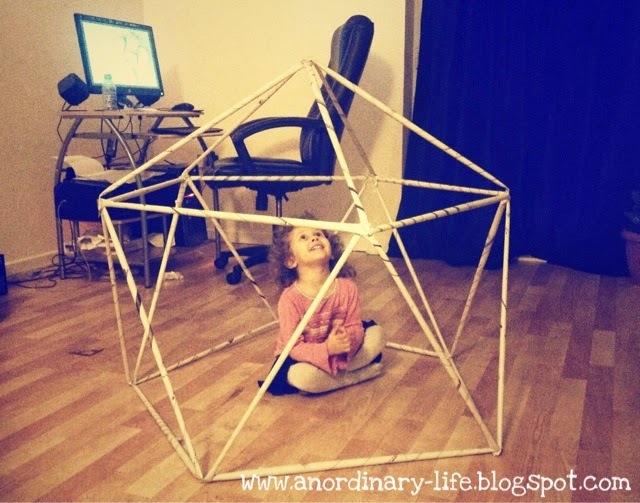 We Have made a few Geodesic domes over the years, they always give a lot of pleasure to my little ones and make for a great cheap homemade den! If you have never tried, I thoroughly recommend you give it give it a go. In this post I will give you step by step instructions on how you can build your own. A geodesic is defined to be a curve whose tangent vectors remain parallel if they are transported along it. The term, geodesic, comes from geodesy which is the maths and science used to measure the earth! A geodesic dome is made purely of triangles, it is a simple structure made using straight lines to create a curved structure. For our Geodesic dome we are going to use newspaper, tape and staples. First, to add to the fun and make it easier to construct, gather some friends or family members to help you. It took us two people to make our one today. First you will need to roll up lots and lots of newspapers. 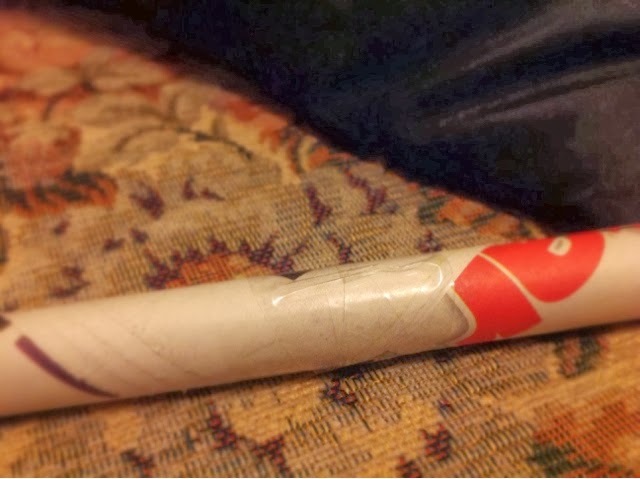 You will need to use 4 sheets of newspaper a time and roll it up from one corner as tightly as possible. TIP: It is VERY important to roll it super tight as it will give your rolled paper more strength. When you reach the end of the newspaper, stick it in place with some form of sticky tape like this. This is just so it doesn't unravel! You will need 25 of them in total. 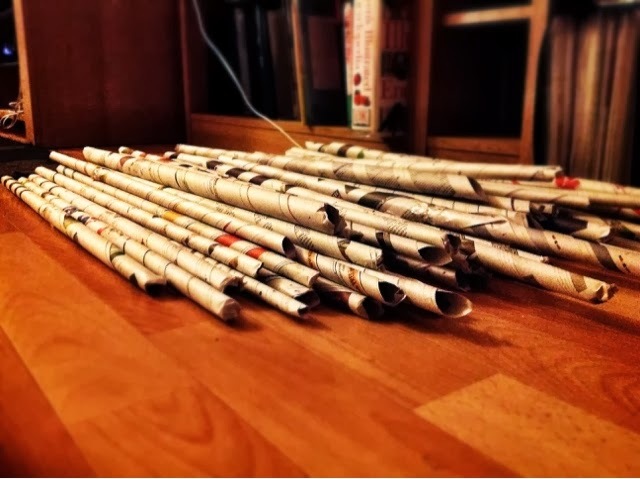 Cut all the rolls of newspaper so they are the same length. You want them to be as long as possible so don't hack too much off. Ours were 65cm long each. If you have time and would like to make this project more arty you could decorate your paper sticks at this point with your felt tips, glitter, buttons or anything else you can think of. THIS MUST BE DONE BEFORE THE CONSTRUCTION OF THE DOME IF YOU ARE GOING TO DECORATE IT. 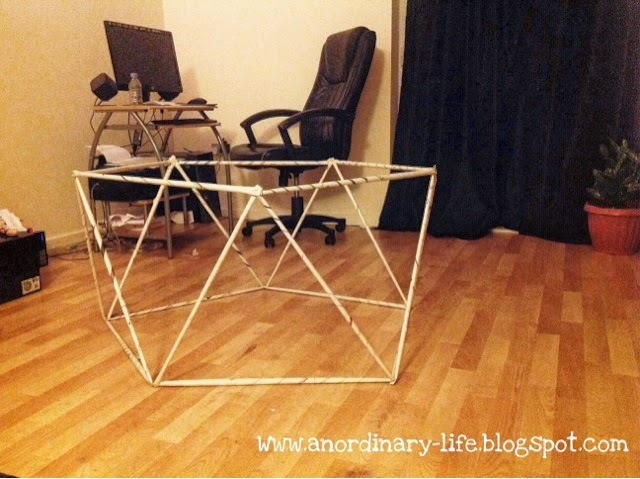 Make 5 triangles by sticking them together with tape and reinforcing them with a staple in each corner. This will use 15 of your paper sticks. Stick the bottom corners together. Use the stapler to reinforce this so you have a star shape on the floor. You will need 5 more paper sticks for this step. 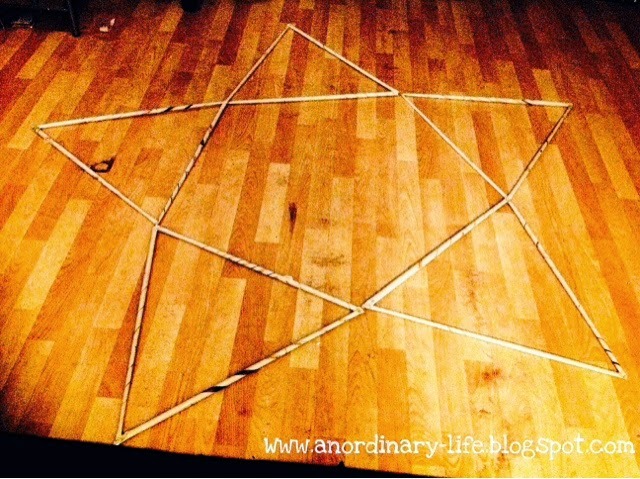 Tape a stick so one end is stuck to the top of one of the triangles on your star shape to the top of the next triangle. We used a staple gun to reinforce the joints for this too. If you are doing this right you will need a friend to hold it up as you go round because your dome will start to take shape already! You will need another 5 paper sticks, this will be the last sticks you have. 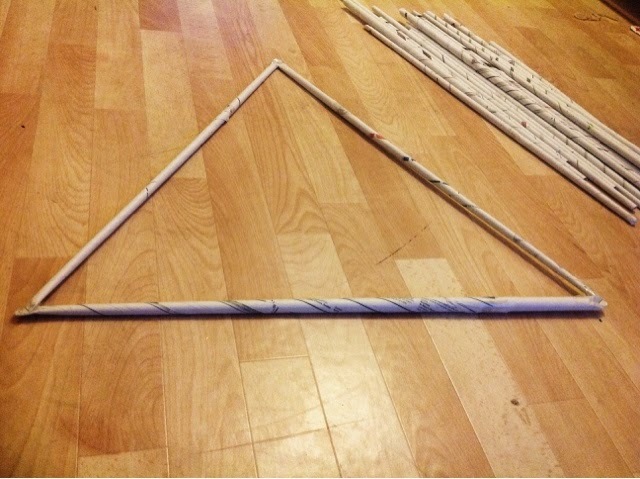 Tape a paper stick to the top of each of the triangles. We used a staple gun to reinforce the joints again. 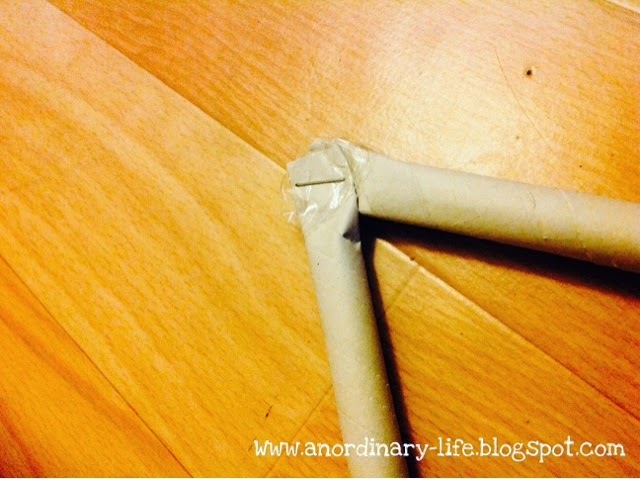 Tape these loose sticks to the centre. This completes your dome and you're ready to play! How can you turn it into an experiment? To turn this science and maths project into a science experiment all you have to do is make a prediction. You can do this by predicting how many magazines you think your newspaper dome will be able to support. Then trying it out! You might like to test this now and see how many magazines or books (or if you've made a mini one coins) it can hold! What's the strongest dome you can make? Why do you think the dome is as strong as it is? Can you make the dome stronger? Domes go back to Ancient times, people like the Ancient romans created huge domes using their knowledge of arches, these were heavy and not very strong. Geodesic domes are different as they aren't just dome shaped, they are a curved shape made from straight lines - they are made out of triangles! The reason triangles are so strong is because they have fixed angles that do not distort - they don't change shape - very easily. Triangles are the strongest of all shapes! Why? If you apply pressure to an edge of a triangle the force you put on it is equally distributed to the other two sides of the triangle, this pressure is then transferred to the other triangles adjacent. The stress is shared by the whole structure just like the structure of an egg! You may want to try my other experiment under my physics page: Can you stand on eggs without breaking them? Richard Buckminster Fuller was the man that invented the geodesic dome. Thank you for your brilliant post and photos. I've got school holidays coming up and this will be an ideal project for me to make with the kids. Especially if they get a den to use at the end of it. It will be something that doesn't break the bank either! You’re the best!